The Echinoblog: Greetings from Brussels Belgium! The 14th International Echinoderm Conference! Echinodermata! Starfish! Sea Urchins! Sea Cucumbers! Stone Lillies! Feather Stars! Blastozoans! Sea Daisies! Marine invertebrates found throughout the world's oceans with a rich and ancient fossil legacy. Their biology and evolution includes a wide range of crazy and wonderful things. Let me share those things with YOU! Greetings from Brussels Belgium! 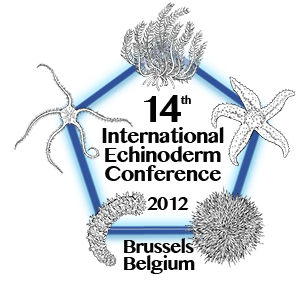 The 14th International Echinoderm Conference! As I write this with 2AM jet lagged eyes I'm listening to the unique techno sounds of Brussels' unique nightlife from my hotel room. 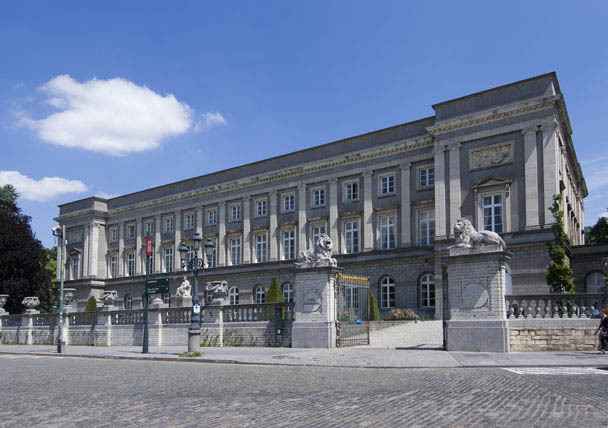 currently being held in Brussels, Belgium at the distinguished Royal Academy of Sciences of Belgium! As I write this, we are on day 3 with 2 more remaining. This is actually the 40th anniversary of Echinoderm Conference meetings, the first of which began in my own Washington DC in 1972. Today the meeting includes 250 participants from 43 countries! SWAG! Meetings gotta have a t-shirt with a cool logo and a satchel to carry all of those program books and etc.! One of my colleagues from Japan is a fellow kaiju/kaijin/monster enthusiast! 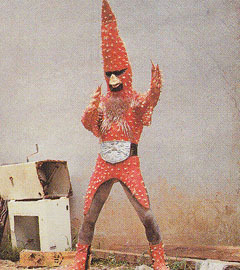 Here is a little figure he brought me of a Japanese starfish monster! The name is HITODANGER..a combination of the Japanese word for starfish... hitode+"danger"!! Look forward to more on the Twitter Stream under the tag #14echino! I pursue starfish related adventure around the world with a critical eye and an appreciation for weirdness. Support has been courtesy of the National Science Foundation but the views and opinions presented herein are mine and do not reflect the opinions of them or any affiliated institutions. Need to hire an invertebrate zoologist/marine biologist? Please contact me! Echinoblog Video Playlist on YouTube! Some bonus swimming sea cucumber video!! Sand Dollars ARE Sea Urchins. Please make a note of it! Why Sea Urchin sushi (uni) tastes SO frakking good! 10 of the WEIRDEST Antarctic Invertebrates!! Because you demanded it! : THE SEA PIG!! aka Scotoplanes globosa!!! How many starfish species are there?? Where do they Live? How long have they been around? Five Points about Sea Star Diversity! What Are the World's LARGEST Starfish?? SEA STAR DEFENSE! How do starfish protect themselves?? What (and How) do Sea Urchins Eat? Sea Urchin Feeding Roundup! What we know about the world's most venomous sea urchin Toxopneustes fits in this blog post! Florida Museum Natural History Blog! Skeptic Wonder- An Awesome Protist blog! University Museum of Bergen Invertebrate Zoology Blog!